On most days, we don't really consider the three flights of stairs it takes to get from the street to our studio to be a liability. It's not that we want them or ever really celebrate them, but they're nothing we can't handle. We don't have an elevator or a dumbwaiter to transport people and gear. All of the pianos that are in our studio were hauled up those steps - very carefully, with a lot of grunting, cussing, perspiration and men - and they're all going to be staying there for a long, long time. We hear, fairly frequently, the weak and unsubstantiated grumbles of a band of young people not used to much in the line of physical activity other than lifting glasses and bottles or performing for an hour every night. They groan, not because of the staircases, but because of the hangovers, the cigarettes they've found to be habit-forming and a road doughiness that makes everything a little more strenuous. We worried -- this day -- about our three flights of stairs because, not only are the legendary Blind Boys of Alabama senior citizens, they're also true to their name: blind as you can be. They move slowly - the three blind boys/men who still make up the vocal choir section of the group (founding member Jimmy Carter, Bishop Billy Bowers and Ben Moore), which originated in Talladega, Alabama, in 1939 - and they rely completely on the guidance and surefootedness of those at their assistance. Leading them down hallways, with their arms clipped into your own hooked wing of an arm, you begin to see things differently. You start to notice the narrowness of the hallway that you've been passing through for years, never minding, never acknowledging. You start to realize that there are problematic, sharp angles that need cautionary explanations. There are bumps in the walking surface and pieces of carpet or ledges that can be easily tripped on with tentative, shuffling dress shoes. You realize that you've never really had to explain to someone EXACTLY where the toilet is and not just find yourself off the hook by saying, "End of the hall, can't miss it." It's these seemingly small and insignificant details and observations that can somehow make you marvel even more at these men and a spirituality that's led them from the very beginning of their professional careers. What could have been seen as a novelty - these blind men singing gospel songs and then needing to find other blind men to fill in for those who have passed away, succumbed to old age as five past members have over the course of over 70 years - is actually one of the most affirming parts about this group. They are led through this great darkness by the same faith that they give deep and resonant voice to in their selection of songs, all of which are powerful only when the people singing them are bringing their own power and soul into their veins. 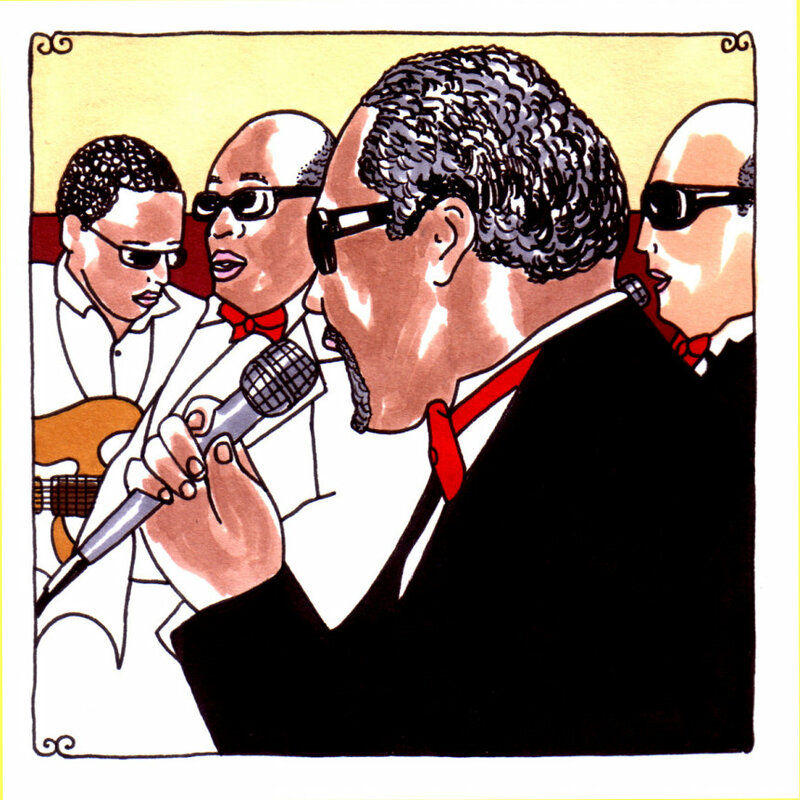 The Blind Boys of Alabama live through the blindness that they've been afflicted by, with a passion to actually see and feel a God that they've already made some kind of connection with, some kind of reconciliation with. They've had their sight stolen from them, and the way that they sing - together and with such a strong and booming vitality - you realize that they're not at all without. They allow you to put many things into perspective and you understand that there are lights on inside them that are keeping them from real blindness - the kind of blindness that could really make you feel like a poor man. Even for the most skeptical of us, reluctant to find anything other than fantasy in religion, there is something in these men that makes a believer out of you. They have fires within them that allow for their own joyous living, for an absence of pity and for a desire to share what they've found. We find even more joyousness there.